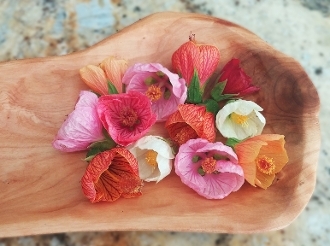 Brand new variety of Edible Flowers! A wonderful mix of pastels, including white, orange, red and shades of pink. Mild tart flavor with a look similar to poppys. Innovative addition to all kinds of dessert plates. Add brilliant color to mixed green salads. A mixologists dream garnish! Flowers are about 2" long.